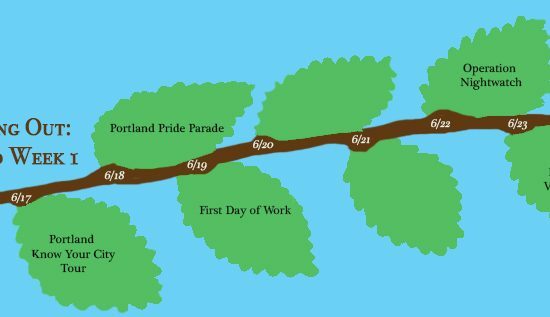 My partner organization, OPAL, is located on the border of “Portland” Portland and East Portland — 82nd street is basically the dividing line. “Portland” Portland is the Portland you see in the media and on TV, with the glamorous skyline and people drinking fancy coffee and eating at expensive restaurants. East Portland is lower-income and has higher crime rates. In fact, the street I work on is known for prostitution and selling drugs. It is kind of sketchy, to say it in the simplest terms. OPAL moved to this location about a year ago, and they had a break-in within the first month. When I got there, one of their windows was broken. Needless to say, it was kind of intimidating to start working in an area like this, especially since I had never before spent an extended amount of time in a low-income and high-crime area. We talked about the safety of the area during DukeEngage’s first on-site visit. The next day, my supervisor took me and another intern (not a DukeEngager) around our office’s neighborhood. As we walked down the street past the #72 bus stop, I saw a man leaning against a wall. He said, “Hey,” to me as I passed by. I ignored him. My supervisor bought us lunch at a Banh Mi place and talked about the history of crime in the area. He told us where to go if we couldn’t get into the office. He told us that the crime was mostly directed at people who knew each other, and it was mostly petty crimes like theft. This made me feel better about working in this area. But as we approached that same stop on the way back from lunch, we passed the same man again. I saw him look at me. I was on the side closest to the wall. He stepped away from the wall and towards the sidewalk. He came right up to me. Closer than arm’s length, right up to my face. He said, “Hey,” to me again. I kept walking, but I suddenly felt unsafe. I couldn’t keep the cycling thoughts from running through my head: What did he want? Why did he directly approach me when there were two other people with me? I didn’t understand, but I was scared. I didn’t see him again for a while. I thought I was safe. But then he started reappearing. He would stare and say little things like, “Good morning, beautiful.” It was really creepy. One day, I was walking past that same bus stop and, lo and behold, there he was. He was with a girl with pink hair, and I saw him hand something to two teenagers. A transaction: he was a drug dealer. I think he saw me see this. As the two boys left, I walked past him, and he started yelling at me. Aggressively. “Hey, hey, hey, hey, hey, hey!” he shouted louder and louder as I walked further away from him. I kept walking, but he would not stop. I sped into the office, terrified. That day when I left work, I had a guy in the office walk me to the bus stop. The man didn’t harass me when there was someone between us. Ever since then, I’ve been having guys walk with me after work. But in the mornings, I don’t have anyone to walk with me, and it’s still scary to walk past him and to hear him make comments about me. I still don’t know what he wants. I don’t know why he continues to harass me. I don’t get it at all. I wish I could speak out against him and tell him off, but the truth is that I am too worried that he will react violently if I do so. This isn’t an isolated experience. It’s still appalling to me that one day I walked out of Target downtown and was catcalled by a man who had a baby, his wife, and daughter with him. I’m still shook by the time I was walking through the park and saw two guys look at me and whisper to themselves “What about this one?” and then subsequently approach me. Men yell at me from their cars and honk at me as they drive past. I really don’t understand why they do it or why they think it’s acceptable. I wish I could end this by saying I’ve figured it all out and that I’ve come to some grand conclusion about street harassment, but I haven’t. I have learned that street harassment is part of city culture, which I never understood before growing up in the suburbs or walking around Durham. I didn’t expect it. When I went to DukeEngage academy and they talked about differences in culture, I never expected it would apply to Portland because it’s in the U.S. But I’ve had to accept street harassment as part of this city’s culture. I’m not saying this is the way it should be or that it will never change. But for now, I’ve adapted my behavior to keep myself safe. I’ve stopped wearing skirts and dresses to work. I walk fast to work every day when I pass that bus stop. I carry pepper spray visibly when I walk around the city, and I ask for support from my coworkers to keep me safe. I am grateful that they are willing to help me. I’ve regained my power because I know that I don’t owe any random stranger on the street my time or energy to respond to their comments and I know that I have a strong support system to keep me safe and help me deal with the men that seem to have little to no respect for women.